On Monday, November 1, I went to see Gavin Creel at Birdland and gave him a button for participating in my blog last year! He put it on and now it made it onto Broadwayworld’s photo coverage! I’m SOOOOOO EXCITED!!!!! 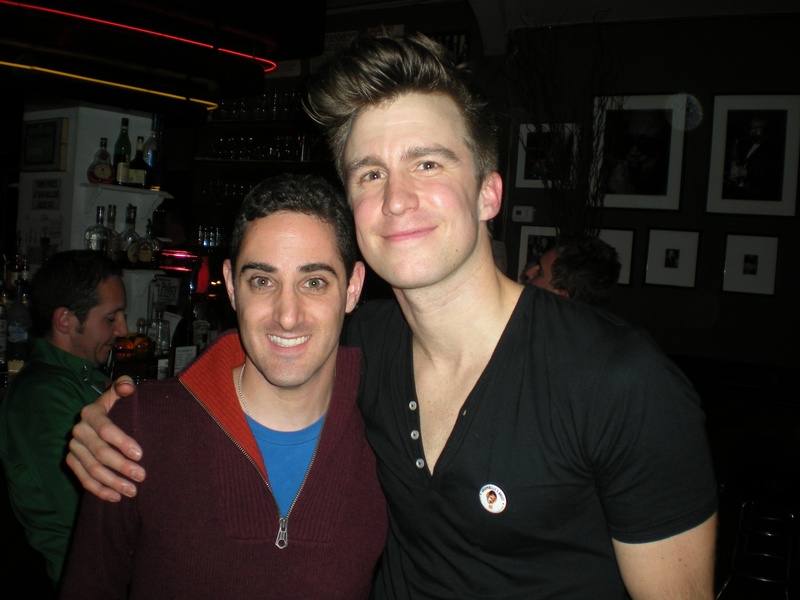 Thank you Gavin Creel for wearing my button for all your pictures! Thank you Jim Caruso for allowing me to attend last night’s show! Thank you Keith for waiting with me after the show & taking my picture! Most of all, Thank You to my friend Gail for making me my buttons! I’m so grateful to you all!!! Here are the pictures singled out….All photos by Monica Simoes, except the one of me & Gavin. On Monday, November 1, I attended the first of three concerts from Two-Time Tony Nominee and fellow “Adaumbelle’s Quest” participant Gavin Creel‘s brand new show “Back To New York” at Birdland as part of Jim Caruso’s Broadway at Birdland Series. No Gavin concert would be complete without a few surprises…for starters, Gavin brought fellow “Hair” cast members Caissie Levy and Steel Burkhardt up on stage to sing a song they all wrote together called “Flower Children” which is a song from their view of what’s going on in the world and what’s to become of the “Flower Children.” Another delight of the evening was when Gavin spotlighted his friendship Celia Keenan-Bolger (“Olive” from “25th Annual Putnam County Spelling Bee”) and performed a song he wrote for her for her wedding called “You.” It was a beautiful song about finding the one you love. Gavin ended the night on quite a high with a new song called “Get Up” about standing up for what you believe in whether that be in a personal relationship with someone or in society. Gavin is many things: an actor, a singer, a songwriter, a performer, and most of all, a genuine, kind, and hard-working individual who values life and the people he has in it! With only two more chances on November 8 and 15 to see Gavin performing his show “Back To New York” at Birdland, I highly suggest you call 212-581-3080 to see if there are any tickets left! Be sure to catch Two Time Tony Nominee and fellow “Adaumbelle’s Quest” participant Gavin Creel in his brand new show “Back To New York” at Birdland on Monday, November 1, 8, and 15 at 7pm as part of Jim Caruso’s Broadway at Birdland Series! Gavin will be performing new material from his new EP “Quiet” which is an intimate collection of six original acoustic session songs as well as some favorites! If you’ve never seen this dynamic performer on stage, now would be a good time to come see why he’s so great! Whether he’s in front of the camera acting or behind the scenes as a film maker, Michael Stever, is making art for all to see. 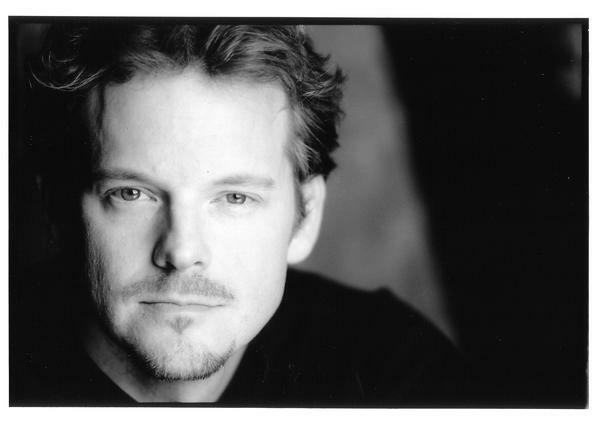 Michael has worked with some of the biggest names in entertainment. As an actor Michael has performed in both theatre and television in such shows as “Super Force,” “Deadline,” and “Arsenic and Old Lace” starring the legendary Betty Garrett. He has filmed Debbie Reynolds induction into The Friars Club, Mary Bond Davis in her “The Next Food Network Star” video, Judy McLane at the Laurie Beechman theatre, musical virtuoso Janice Martin, various events for The Screen Actor Guild’s BookPals group, Barnes and Noble, and Playbill magazine columist Ellis Nassour. He also filmed and lent his voice to Broadway Impact’s “Defying Inequality” Broadway concert where he interviewed such performers as Lynda Carter, Gavin Creel, Jonathan Groff, and Tamara Tunie. He was the Unit Production Manager on the critically acclaimed documentary “Broadway: The Golden Age” while his short film “Ghosts of Zion & Michael Nyman” was featured on the Indie film website “Shooting People.” Michael also shot and edited the Actors Fund benefit reading of “Valley of the Dolls” as well as ABLE Rigging Contractors’ brand new website. He is the official camera man for “The Brini Maxwell Show” podcasts and most recently he completed filming and editing the new commercial for Boy Butter Personal Lubricant starring drag superstar and fellow “Adaumbelle’s Quest” participant Hedda Lettuce. Finally, in what will be his first independently produced short film, Stever is producing “Saturday Nightmares; The Ultimate Horror Expo of All Time!” No ordinary Horror Expo, this unprecedented event brings together the entire George A Romero family! Also features Adrienne Barbeau, Tom Savini, Roy Fumkes, Ken Foree, John Amplas, Joe Pilato & many more. Coming soon to Amazon.com. 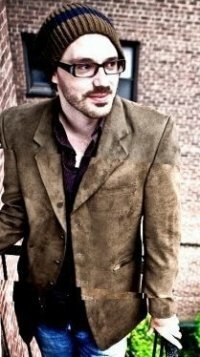 For much more on Michael and all of his projects be sure to visit: http://www.michaelstever.net. 1. Who inspired you to be both an actor and a film maker? That’s a hard question, but as a filmmaker, I would say “King Kong” and Fay Wray were my first muses in that sense. I started playing with my mom and dad’s 16mm video camera from the time I was 7 or 8 years old and was a big fan of “King Kong” and Fay Wray and I basically wanted to re-create King Kong. All I had at my disposal was a “Planet of the Apes” doll which I used as my King Kong then stuck him on this round plastic garbage can, and got a plane and put that on a string and that was my King Kong, it was very simple. As an actor I would have to say Jessica Lange. I was a big fan of the 1976 remake of “King Kong” which she was in, but the movie itself got ripped to shreds and she didn’t get a lot of respect for it, but she worked really hard and gravitated to really challenging things as an actor and she got an Oscar nomination for her role as “Frances Farmer” in “Frances.” To me that was pretty great. 2. Who is the one person you haven’t worked with that you would like to? I’d love to work with the amazing Jan Broberg who I worked with years ago. She has had some great opportunity’s as an actor, specifically in the WB series Ever wood. Jan also published a book a couple years ago called ‘Stolen Innocence‘ which chronicles her kidnapping when she was 12 years old at the hands of a trusted family friend. We have discussed shooting a documentary together that centers around her and her ordeal, but nothing is finalized on that, though she was recently in Los Angeles to see if Lifetime would produce her story into a film, which is pretty exciting. I’d also love to work with Margot Kidder, who I’m a big fan of and Angelica Torn (the daughter of Geraldine Page and Rip Torn). Angelica’s been out on tour with “August: Osage County.” She’s brilliant. She is also the person who murders the little girl in “Sixth Sense.” Would love, love, love to work with her. 3. What’s your proudest moment both as an actor and as a filmmaker? As an actor that would definitely be “Arsenic and Old Lace” with Betty Garrett and Carole Cook. It was one my first straight plays I did and Betty Garrett is a legend. My other proudest moment is when I made my TV debut in a sci-fi series called “Super Force” and I had a fight scene with Traci Lords, which afterward I became a big fan of hers. 5. If you could dream about anyone while you sleep, who would it be? I can tell you who I have dreamt about. I actually had the fortunate experience of meeting Fay Wray, who of course was the original star of “King Kong” who was also a silent film icon. I kind of had a thing for Fay Wray as a kid and I never thought I’d actually meet her, but fate intervened and I got to meet her when I was working on “Broadway The Golden Age” and I learned we had so many things in common. When Fay passed away, I finally read her autobiography learned there were more things we had in common. I had this vivid dream about us, but I really think she was a muse and guiding force for me on many levels. 6. Starbucks or Dunkin’ Donuts? What do you order? Starbucks. Their coffee is stronger. I used to do coffee all the time, but now I do espresso. I get 2 shots of espresso, with a pump of cherry syrup and chocolate. 7. Favorite way to stay in shape? Since I’ve been editing, that’s been really difficult, but over the past few years, my favorite way to stay in shape has been yoga and bike riding. 8. Boxers or Briefs? Both…it depends on what I have. 9. Favorite website? Youtube and Rottentomatoes.com. 10. Superman or Wonder Woman? Both, with a lean to Wonder Woman, though I do think the original “Superman” movie is one of the best movies ever made. The scene where “Lois Lane” crashes into the Daily Planet in the helicopter, I think is probably next to King Kong my favorite scene in all of movie history. 11. Favorite TV Show Theme Song? There’s been so many. I was one of those kids who wanted to capture everything from the television so I would just stick my parents tape recorder up to the television and record things. 12. Favorite way to spend your day off? I love to watch movies, take yoga, or ride my bike. Tonight’s installment of the “True Colors Cabaret” at Feinstein’s at The Regency will feature two-time Tony Award Nominee & fellow “Adaumbelle’s Quest” participant Gavin Creel. Gavin will be joined by Helen Hayes Award Winner & “Adaumbelle’s Quest” participant Natascia Diaz along with Jerry Dixon, Joey McIntyre, and Sutton Foster. What makes tonight even more special is Natascia, Jerry, and Joey will be delighting audiences with selections from the Off-Broadway smash hit “Tick, Tick…Boom” which the trio starred in together in 2001. Get ready to celebrate love tonight!